The Beebe River flows 16.7 miles from Black Mountain Pond in Sandwich, NH before joining the Pemigewasset River near the town of Campton. As with all rivers and streams the Beebe River is home to all manners of aquatic life, but thanks to the Beebe River Restoration Project, a Plymouth State Clusters Initiative, this summer the river is also home to Plymouth State University students, faculty, and researchers. The river is home to wild eastern brook trout, which thrive in cold waters, and the Beebe’s undeveloped tributaries offer prime spawning ground and a cooler habitat when the main river warms in summer. Road crossings along the Beebe and its tributaries are currently managed with culverts beneath the road’s surface. However, low stream flow (as observed during the dry summer of 2016) and culverts blocked with natural woody debris can prevent the trout from reaching or returning from the streams. The goal of the Beebe River Restoration Project is to restore natural hydrologic flows into the river by replacing the culverts with bridges and removing barriers allowing fish passage. It sounds simple, but it is a complex project with many moving parts, implications, and a dedicated team of professionals, students, and volunteers making it happen. PSU was introduced to the project in early summer of 2016 when Tyson Morrill ’18, a volunteer with the New Hampshire Fish and Game Department who monitorted trout along the river, became a graduate student in biology at PSU. As part of his graduate program, Morrill designed a plan to study the Beebe River brook trout population pre-and post-restoration. The PSU Cluster Initiative team consists of two Plymouth State faculty members, two graduate students, four undergraduate students, and an alumn; Amy Villamagna, Ph.D., assistant professor of environmental science and policy, Brigid O’Donnell, Ph.D., associate professor of developmental biology, Tyson Morrill, graduate student in biology, Katerina Crowley, graduate student in environmental science and policy, Samantha (Mac) Bevier, environmental science and policy major, Zach Newcity, environmental science and policy major, Griffan Nyhan, environmental science and policy major, Nick Scola, interdisciplinary studies major, and Jared Lamey ‘17, BS, Biology. 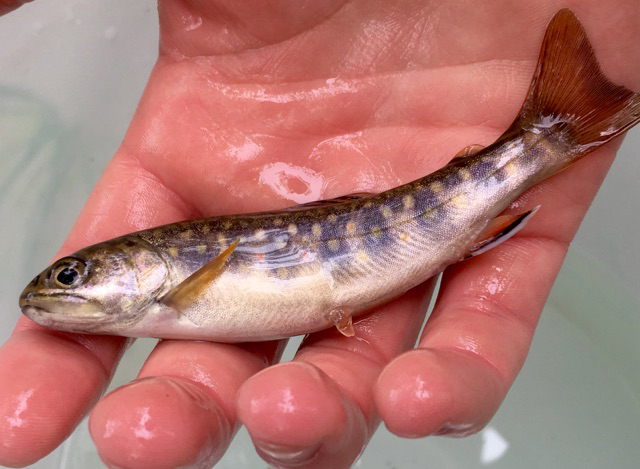 The PSU team is working alongside NH Fish and Game to electrofish or “shock” the water, making it possible to tag and collect data on the trout population. After tagging, the team will temporarily relocate fish when construction gets underway to avoid any negative interaction. Volunteers from Trout Unlimited Pemigewasset Chapter, often as many as 20 or more, regularly pitch in to help the team with tagging and data collection. In addition, members of the PSU community and community-at-large have often waded into the Beebe to lend a helping hand. The entire restoration project is spearheaded by Nancy Bell, Vermont and New Hampshire director of The Conservation Fund. According to Dr. Villamagna, Bell is the catalyst who makes the whole operation happen. Plymouth State is responsible for the scientific aspect of the project. The team is currently gathering data to determine the state of the fish population and general health of the river pre-restoration. Once the culverts are replaced and natural stream flows are restored, PSU will continue tracking and monitoring fish, monitoring macroinvertebrates, wildlife and fauna along the river, and analyzing data to determine the health of the river. Morrill’s graduate studies, co-advised by professors O’Donnell and Villamagna, will take him through the pre-restoration phase of the project, while another graduate student will continue post-restoration. The PSU team’s work this summer was funded through a cluster grant from the Tourism, Environment & Sustainable Development cluster. In addition, Nancy Bell has submitted a grant application to The Conservation Fund to help support and expand PSU’s involvement going forward. “Our vision is to eventually use the Beebe River watershed as an outdoor classroom for undergraduate and graduate students from the sciences, policy, and geography departments, as well as history, art, and other programs,” says Villamagna. 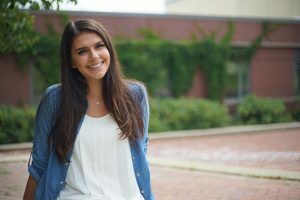 Samantha “Mac” Bevier, one of the undergraduate students working on the project, credits hands-on opportunities such as this as a primary reason she transferred to Plymouth State University. “I want to do the research, not just hear about it in lecture,” says Bevier.